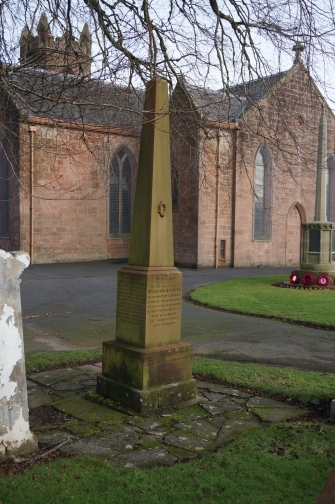 The red sandstone obelisk is located to the right on entering the main gates leading into the car park at Auchinleck Parish Church. Peden was buried in secret in the churchyard in Auchinleck, but after a few weeks this was discovered by the soldiers. They dug up the body and carried it into Cumnock, where they intended hanging it from the gallows tree. Instead, they buried it at the gallows foot, where a monument now marks his grave. See Old Cumnock - Peden's Grave. 2. Airds Moss and Rev Richard Cameron. The Battle of Airds Moss (1680) took place within Auchinleck parish, although it is closer to Muirkirk. The other two sides of the monument commemorate WIlliam Murdoch, inventor of gas lighting, and William MacGavin, author of The Protestant.